The FOI request reveals that the three men stayed at the Marriott Hotel, which cost a total of CI$1,386 for three rooms for four nights. The car hire cost for the officers was CI$249.26 and each of men also received $75 expenses per day, which came to a total of CI$1,125 for the duration of the visit. In total the cost of bringing out the three officers was $2760.26. The RCIPS said it had been willing to pay the cost of the three offiers' flights but the information manager said that Cayman had not received a bill from the UK for them. According to Police Commissioner David Baines, the short visit was designed to allow the Chief Constable of Merseyside Jon Murphy, Det Chief Supt Brian McNeill from the Association of Chief Police Officers (ACPO) and Det Chief Supt Tony Doherty, head of the Merseyside force’s Matrix gun and organised crime squad, to not only review where they would be sending their twenty UK officers but to advise the RCIPS how best they could be used. They also reviewed the investigations and offered some advice on gang crime, the commissioner said. During the four-day visit journalists from the Daily Mail tailed the officers and took snaps of them enjoying down time, which appeared to conflict with the official timetable of the work the men were said to be doing. The British tabloid reported that the photos showed the officer “sunbathing, snorkelling, sightseeing, reading novels and soaking up the sun in 84F heat”, which it said was unlikely to go down well with colleagues back in Liverpool as they worked in a chilly 55F. 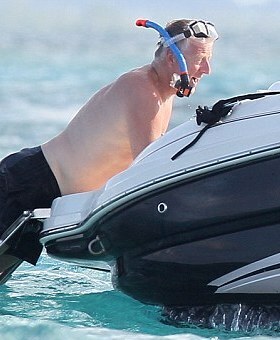 “Over two days, they were seen relaxing on the beach, enjoying a four-hour boat trip and swimming with giant stingrays on a beautiful coral reef,” the Daily Mail said of the senior officers during their Cayman trip. The three UK top cops reportedly arrived on in the evening of Monday 3 October but were followed by the Daily Mail through Wednesday 5 and Thursday 6 October. The paper reported that the officers were involved in meetings with the RCIPS from around 9pm until before 4pm on Wednesday, when the police were on the beach at their hotel but on Thursday the reporters watched the officers enjoy almost a full day of leisure activities. Murphy accused the reporters of spying on him, while the commissioner said all three officers had on average worked 12 hours a day. "I think it's a travesty that it's being presented in the way that it is," Baines told the UK media in the wake of the Daily Mail report. Since the visit, twenty officers from different police forces in the northwest of the UK have reportedly been partnering with local detectives working on the September shootings. So far, police have charged one man with the last of the murders which took place in East End. Chakame Jamelle Scott (18) was charged last month with the murder of 21-year-old Asher Williams McGaw. Although officers also arrested two men on 2 November in a special operation in connection with the fatal shooting of 24-year-old Andrew Baptist in West Bay, no charges have been announced against these two suspects and police have not yet confirmed if the men have been released from custody. The murder investigations are continuing into the five incidents and the UK officers are expected to remain in Cayman until the end of this month. Hopefully this will teach the UK that to help Cayman out is like giving your dog a shower and sending them back outside. Worthless in the long run. That's still $3K too much. soooooooo what was the point of this trip again? 4Days ?? Could we all please focus on the ones who are the real big spenders in these Islands? I give you a hint, it is NOT the Snorkling Squad! Less than $3000? hahahaha that is the funniest thing I have heard in years. CNS, Someone got clever with a calculator. Thanks for trying anyhow. That is a heck of a lot less than McKeever is costing us and he receives a big salary, pension, global travel expenses etc and we have recieved nada zilch results. But for all the Caymanian nay sayers thats not the point right? Assuming the BA flights come to roughly £2000 the total bill to the Cayman Islands is probably a bit over CI$5000 but the visit cost the people here in Merseyside (the ones who pay these guys salaries!) a heck of a lot more. The trip used the services of three senior policemen for 15 working days (including travelling time), all of which must be covered by other officers, during this time they were contributing f*** all to the policing of their home patch. That's a cost to the local Council Tax payer in the UK of somewhere around £30,000 plus any entitlements they accrued as a result of the trip. They have now sent 20 officers from the same UK payroll out to Cayman. It may make great sense to the the FCO, the Governor and the Police Commissioner but to people of Merseyside it all looks a big jolly at their expense. Cayman's 'crime wave' is nothing to the crime levels of Merseyside and to release officers to try to clean up problems that are little more than a rough weekend in some areas around here is nothing short of criminal. We hear Jon Murphy is being considered for a job in the London Metropolitan Police Force – we hope he gets it because he's bugger all use to us here. Erm, From Merseyside, we don't give a Beatle's arse what it cost you in Merseyside; the FOI request was all about what it cost us here in Cayman. But seriously, I genuinely respect and sympathise with your post and its content other than the fact you give a Guardian/Grauniad website. Unless one is a Polly Toynbee teacup liberal prepared to accept the fact that the Guardian campaigned in its usual pompous and outraged liberal manner against "tax havens" while its owner the Guardian Group was registered in one, one would avoid such a website. OK, if you don't like the Guardian try looking at the Liverpool Echo for 4 August 2011. That's where they lifted the story from. I will keep an eye out for Cayman stuff on Ebay. You can have ours back to replace Murphy! We can do a swap, your hardworking constables for our seniors. Wonder if the AG will be checking these figures against the available RCIPS entertainment budget or miscellaneous account. I gather from the 8 thumbs downs that some of our local Merseyside officers currently on TDY with the RCIPS take time off from their investigations to read CNS. I think a lot of us back here have a pretty good idea why you prefer working in the Cayman Islands and it's nothing to do with the sunshine and happy hour drink prices. I think CNS deserves credit for printing the truth about this trip. I am not the only one to have gotten the feeling that CNS, since Tempura (or SPIT as CNS liked to call it), has enjoyed "stirring up" the old "UK cops on a junket" stuff, much as that bastion of responsible journalism, the Daily Mail, likes to do. But credit for this article (although there will no doubt be posters who begrudge even the $3000).